Our Twin Cities clients receive a week’s worth of meals at a time, including breakfast, lunch, dinner and snacks. We believe that food is medicine, and eating delicious, nutritious meals helps make our clients’ medicines and treatments more effective so they are able to lead healthier, more independent lives. With that goal in mind, our chef and dietitian work together to create a variety of menus that not only meet the nutrition needs of our clients’ diseases, but also taste delicious. All of our food is cooked in-house — with the exception of items such as crackers, granola bars and breakfast cereal — including all breads and baked breakfast items. We include sustainably produced, local and organic ingredients wherever possible. In fact, we’ve planted urban gardens that produce lots of tasty veggies for our kitchen. Volunteers are integral to our work. We offer opportunities to cook, bake, deliver, plant and harvest food. Volunteers love working with us because it’s fun, meaningful and they can immediately see and feel the impact of their work. – This year, our community of more than 7,300 volunteers will help cook and deliver more than 600,000 meals for people living with life-threatening illnesses. – Volunteers give us 69,776 hours of their time each year, the equivalent of 33 full-time staff people. – We welcome about 230 volunteer delivery drivers each week — from individuals to corporate teams — who make the final connection from our kitchen into the thankful hands of our clients. – Our clients include people living with cancer, HIV/AIDS, multiple sclerosis and ALS (Lou Gehrig’s disease). – Currently, we serve approximately 1,100 clients, caregivers and dependent children each week in the Twin Cities area. – We currently serve clients living in more than 100 Twin Cities zip codes. – Our five urban farm plots, which we call Open Farms, will produce about 10,000 pounds of organic vegetables to use in client meals this year. Download an overview of our service. This smoothie has a beautiful, bright orange color- the perfect drink to invite in some sunshine! You can follow the link above for the full recipe. 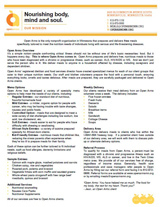 Stay in the loop about Open Arms of Minnesota! Subscribe and you'll get weekly recipes from our kitchen, stories about our clients and supporters, special event invitations, and ways you can help nourish people in our community living with life-threatening illnesses.